Boy. That escalated quickly. I mean that really got out of hand fast. That was the worst game I’ve ever seen the Spurs play. No qualifiers, no hyperbole… just terrible. I don’t want to look up the historical data or anything because, honestly, if the Spurs have lost by more than 39 points at some point in their history then I don’t want to hear about it and I’m sure you guys don’t either. I’ve been trying to come up with some sort of trenchant analysis for what happened but, like, how do you analyze a wrecking ball destroying a building? At one point the wall was there, then the ball came, and then the wall was gone. Now we have to rebuild the wall, I guess. The Spurs are not good enough right now. Something just seems broken with them. Juxtapose our listless bunch in this game with the Timberwolves who seem to have been infused with life following the Jimmy Butler trade. There’s been plenty of words spilt about how that transaction looks from a talent standpoint, but honestly it looked pretty simple to me watching them Wednesday evening. They took one really good player who didn’t want to be there and replaced him with two decent players who do. Robert Covington and Dario Saric probably aren’t turning Minnesota into a championship contender on their own, but they are better fits than that particular disgruntled star. I don’t think the Spurs have a trade like that to make. I wouldn’t even know where to start assembling one. Our puzzle looks wonky at the moment. There are a lot of really interesting pieces — but they don’t quite fit together. The thought of trading someone like Patty Mills or Rudy Gay or even Bryn Forbes hurts my soul a little bit but, you know what hurts a lot worse? 39 point losses. Maybe they just need another change in the lineup or maybe they just need more time (or maybe Lonnie Walker coming back soon) to COMPLETELY change everyone’s outlook on life. I don’t know. I trust PATFO and I know this whole thing is uncharted territory for everyone, but this was really terrible. Hopefully the Spurs can string together a few wins on the bounce here and we can all laugh about this as nothing more than a single absurd data point. Blowing a big lead against the Bucks was worrisome and then the effort it took to beat the Bulls felt ominous. It seems silly to act like a 39 point loss is yet another warning sign that a storm is on the horizon and not actually, you know, the storm itself. Is this rock bottom for the 2018 Spurs or are there further depths of the abyss we’ve yet to explore? There were many low points in this game, but if I had to pinpoint a specific one that I truly hated the most then I’d have to go with the 2nd quarter where the Spurs scored a grand total of 9 points. It was even worse than the box score looks. 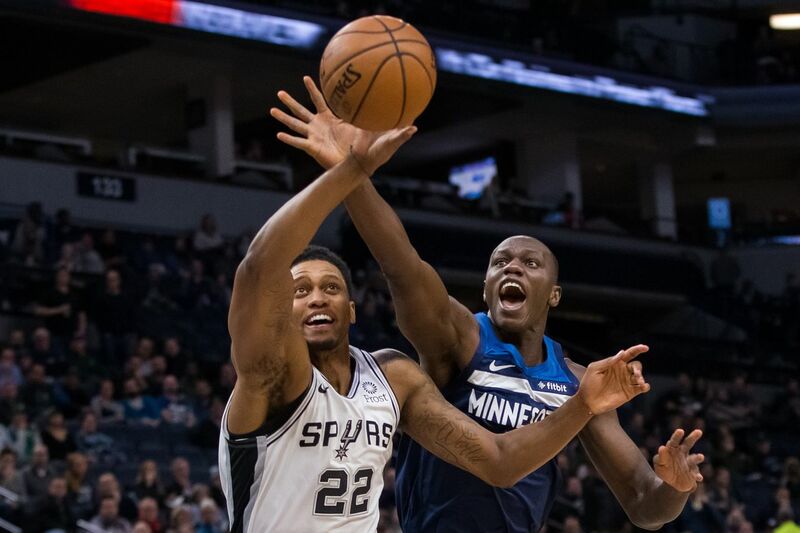 The Wolves punished the Spurs repeatedly on defense and the Spurs simply had no answers on the either end. It was just shot after shot just careening off the rim and any semblance of an offensive game plan disintegrating while Minnesota’s lead ballooned as we watched. Here, I have an extremely scientific video representation of what happened, check it out. I would love for the Spurs to shoot more threes than they do, but they really put on a clinic in this game as to why they don’t. The Spurs had 27 attempts from beyond the arc and (even though that’s about right on our season average of 24.7 attempts) it felt like they were shooting a million of them as miss after miss assaulted my brain in that first half. Again, theoretically, I’d love for the Spurs to shoot more threes because that’s the way the modern NBA works, but these shots just didn’t feel natural. There wasn’t a gorgeous flurry of ball movement resulting in an open man standing in the corner ready to hit a high percentage shot. It was a lot of DeMar driving into the lane, jumping up in the air, and only able to find Bryn Forbes standing too far away. They took contested threes. They took off balance threes. They took threes way too early in the shot clock and then they took them as last resorts. It’s like they were trying to prove a point about how ill-equipped they are to score from beyond the arc. Let me say: message received, fellas. The Spurs leading scorer was Jakob Poeltl. I don’t have anything clever to say about that, other than that’s one of many stats in this game that you could look at on its own and say “if ______ is true then the Spurs aren’t going to win many games.” If DeMar and LaMarcus combine for only 20 points, the Spurs aren’t going to win many games. If the teams turns the ball over 18 times, the Spurs aren’t going to win many games. If they get out scored 29-9 in a quarter, the Spurs aren’t going to win many games. It’s almost a fun party trick to play until it gets too sad and everyone just stares off into the distance in silence. The only silver lining I can find in this whole mess is that no one played too many minutes. DeRozan only played 28 and Aldridge only logged 24. It’s certainly possible that everyone is just a little burnt out energy wise at the moment and it’s showing up in their inability to find a sense of urgency recently. This is not an insignificant thing and it’s something that has to change. The Spurs no longer have the luxury of being able to DNP-Rest guys while pulling out wins, so Popovich is going to have to get creative this year with how he manages everyone. I wish I had a fun Spurs highlight to end this post with but, honestly, I’d rather just not watch any more of this game than I have to. I’ve taken off my shoes and one of my socks and, actually, I think I’m crying.